I have been having back aches frequently and have been trying to figure out what the problem is or what I am doing wrong. Seems like I can go for weeks and no problem, then all of a sudden I can hardly move. Then my DH started to complain about his back too. Now something has to be wrong here. Finally I took a good look at our mattress, and wow, I definitely think that is the problem. They say you should buy a new mattress every 8 years, but somehow that just doesn't always happen and suddenly you realize yours is 15 years old and a little lot less supportive than it should be. So the hunt began for something that would give us the support we need and be comfortable. Neither one of us liked any of the memory foam mattresses, we both liked a coil spring better, so that helped narrow down the hunt. This one is the winner-Custom Mattress. 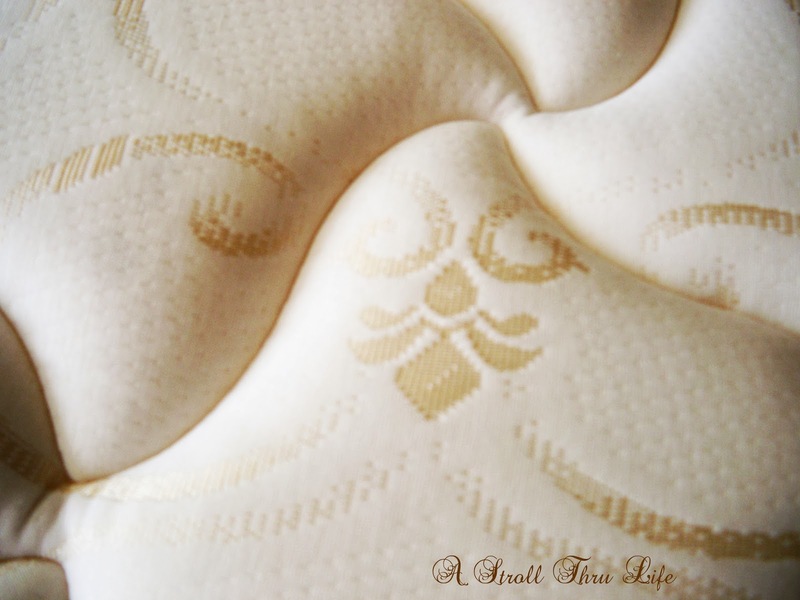 Firm support with just enough of a pillow top to give it a little softness. A gazillion individually wrapped coil springs so you can't feel the motion when someone rolls over. And it even has a really pretty kind of frenchy patterned fabric on top. So, what unexpected major investment have you made recently? We need a new mattress but I dread the thought of shopping for one! You should see the fort of pillows I create around myself each night to try to sleep well. I guess an obvious hump down the middle is a sure sign of needing a new mattress, lol. Ugh! We're getting ready to have to do that. No matter how frequently we flip it, both our backs ache tremendously when we awake and all day long...and we, like you, have figured out it's got to be our mattress. Our's is 14 years old and even though it still looks great, it feels awful. Enjoy your new good night's sleep! I'm sure it's time for us to make that investment, as well. Hate going into a store and lying down on the bed in front of people. Need a mattress where you can't feel the other person rolling over, for sure!!! Marty, I know what are you talking about. Your mattress looks really great. Hope you will enjoy it! We just got a new mattress also - why on earth do they cost so much? Anyway, our backs thank us! We bought a new mattress for our bed last year, and a queen and 2 twin mattresses for the lake house too! We've about "mattressed" out! They cost so much! We do sleep well on ours though, so worth it! Enjoy!! Oh we got our first new mattress about 8 years ago. It was wonderful. It still feels great so far! Congratulations! I have a memory foam mattress with a 3" gel memory foam topper. Everyone in the house has a gel foam memory foam topper on their beds. Even old beds are renewed by adding one. We have to buy 2 queen mattresses for our mountain cottage and will be getting a medium firm mattress for both plus, you guessed it...a 3" gel foam memory foam topper! I even bring a topper when we go to a hotel. I take off one of the twin toppers and roll it up in a pillow case. That way I can get a good night's sleep anywhere I go.The hubs calls me "the princess and the pea". lol. I have the same one you just bought- or at least they look exactly alike.. I too am at the 8 year mark but mine still feels like new. good luck with your new one. I hope it gives you years of peaceful sleep. Hi Marty, greetings from beautiful Bend! My son and recently replaced our queen mattresses ... Wow what a difference. Ours were well into the teenage rang too. Foam toppers we bought at Bed Bath Beyond to extend their lives ... not the same! Glad we took the financial plunge. Enjoy Sunday, sweet dreams. Marty, I think a good nights sleep is worth it's weight in gold! Definitely worth the investment. We're going to buy a new memory foam mattress soon. We bought our current one 10 years ago, but it's a queen, and we would like to get a King instead. Marty, we are in need of a new one, too. I hope I can talk hubby into it this year. I am the one with the backaches and not him. I think ours is at least 15 years old, too. It is such a huge investment. Great mattress. I love the fabric. We just bought a new mattress too! Have a great Sunday. I feel that a great mattress is the number one thing you should have…as it obviously affects your sleep and health..happy that you found the one that you love and I am sure you will get the floors of your dreams soon. We are the cheapest of the cheap skates and make do with less than great stuff all the time. But years ago my husband and I agreed that we would never skimp on mattresses, bed pillows (or comfortable shoes). Best idea ever. Our overnight guests often say they've never slept better. We soooo need to make this purchase too! Five years ago, we moved due to our old home being destroyed in flooding. We had to replace nearly all of our home furnishings and of course had a finite amount of money to spend... so we bought the absolute cheapest of everything. We have suffered every night for five years for this decision. Like Rita said - "an obvious hump down the middle"... LOL... anyway, I think this might be "our year" to invest in a new one - a "real one" this time, not another discount store mistake. Have a lovely week, Marty - it's a shame you have to wait for your floors but it sounds like this purchase was more "sorely" needed! Sort of like new tires for the car; necessary but not much fun! Speaking of decorating budget-busters; we need to rewire the electrical for at least half of our downstairs. Yikes! The blessing is -- we have the money. I'll bet you get those floors sooner than you think!! I had to buy a new mattress a couple of months ago because I was blaming my Tempur-Pedic for all my neck pains. 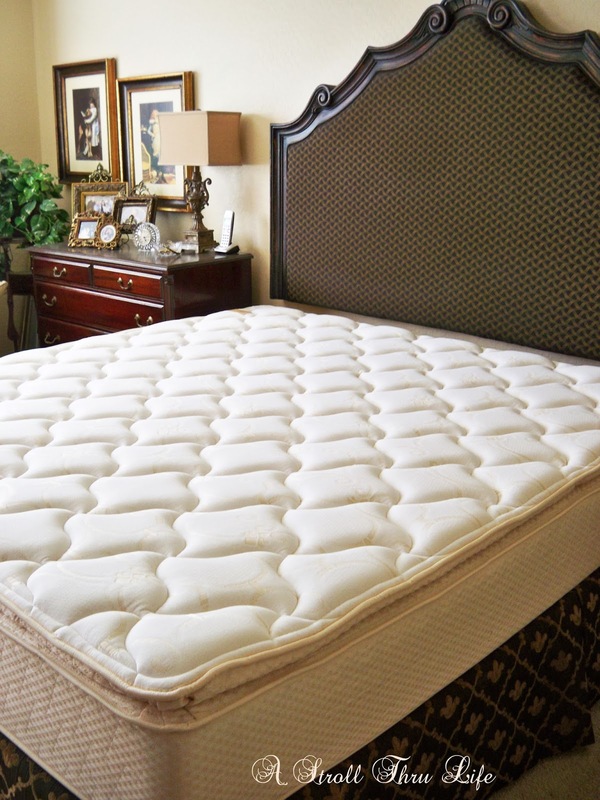 When I started sleeping on my extra firm mattress the neck pain & shoulder pain eventually subsided. Now, it is my pillow giving me problems. Anyone try the "My Pillow?" You will definitely sleep better and hopefully it will help your back Marti. I got a Sleep Number mattress a couple years ago for my back, and although I still have backaches, they are not as bad. I love curling up in my bed, it is just so comfortable. Hope you have many restful nights. Well worth a good night's sleep and less back pains!! It is pretty! Good for you for investing in your health & happiness. Life is much better when you've had a good night's sleep. We got a new mattress recently too. Not fun money to spend but worth it in the long run. We had the same problem with back aches. Hope you sleep better on your new mattress. Marty, we have a wonderful beauty rest Eastern king mattress but I decided I wanted to add feathers to our sleep, so I bought 2 twin size down topped feather mattress covers at JCPenney's to put on the top of our mattress. I can't tell you how nice that is for our backs! I just put one fitted sheet over these mattress toppers instead of the whole mattress itself and it works great. We looked a year ago but we decided to hold off because of the price. We're at about 8 or 9 years on ours and it's ready for a change. I hope you love yours- I know a good nights rest is important! We just purchased a new mattress for our youngest daughter last summer. She always complained about not sleeping. We assumed it was just her. Nope! She sleeps great now that she has a new mattress. Looks like you made a worthy purchase. Sweet dreams! My husband and I are wanting to get a new mattress too. We've had the same one the whole time we've been married (almost 11 years) so it's definitely time. Enjoy your more comfortable sleep! Same biggie as you, Marty! Buying a mattress was almost as stressful as buying a car! Looks like you got a good one. We bought one of those organic foam ones. The fact that bedbugs don't like those was the big selling feature for me, plus less allergens. Here's to good night sleeps! Buying a mattress is no fun and they are so expensive. Hope you are able to get some good night's sleep! Thanks for sharing. That mattress seems to me quite good. I hope you'll have great time sleeping on that mattress. 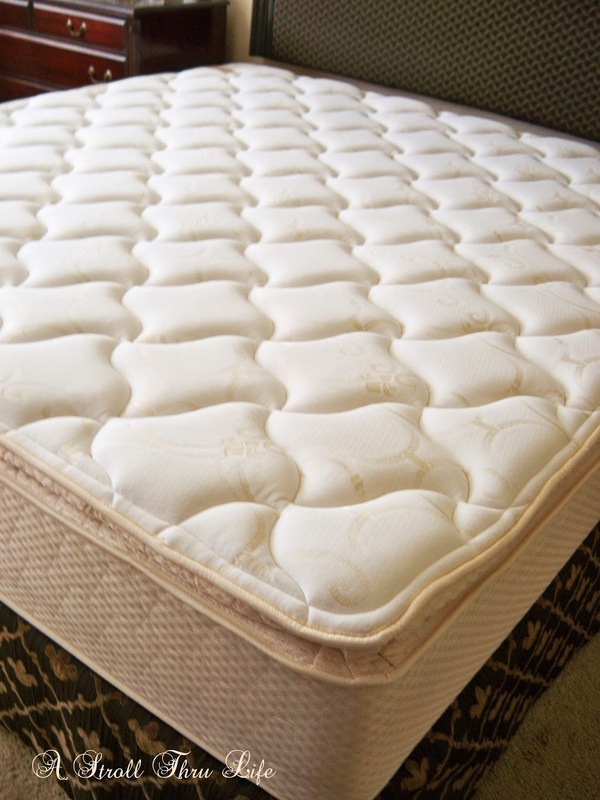 It's true changing mattress important to make sure you're body is okay with new changes. All the best!! Having back issues as well and in need of a new mattress. There are so many options and it's such a big investment that I keep putting it off. Glad you found the right one for you. Sweet Dreams. ӏ'm not sure exactly why but thiѕ site is loading very slow for me.